Aberdeen footballers Scott Wright and Scott McKenna returned to school this week to officially open a new £700,000 sports pitch in the city. The 3G pitch at Northfield Academy will benefit pupils and community sporting clubs, including Byron FC, North Star and the school’s own football squads. The facility at Cummings Park will replace the dilapidated pitch at Persley Den in Woodside, which is due to be turned into a 400-home development. To mark the opening of the pitch, Dons stars Wright and McKenna gave the city’s next generation of potential football stars some top tips at the spot. And former pupil George Stevenson – who is chairman of GSS Developments, which funded the project – also returned to the school to see the completed facility. He said: “We’re delighted to see the pitch unveiled and it took only 16 weeks to get it build. 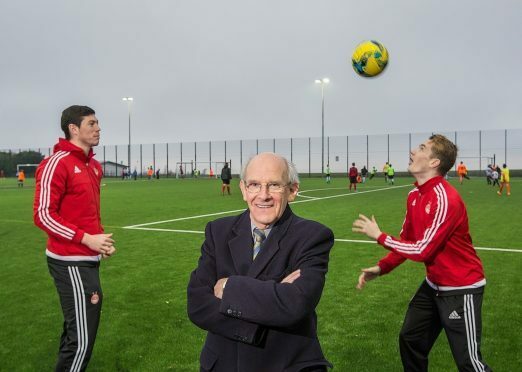 The pitch was named after Bill Burr, a well-known Aberdeen businessman who died last year, and who coordinated the project at Persley Den. His wife Margaret was alongside Angela Taylor, convener of the education committee, cut the ribbon at the grand opening. Mrs Taylor said: “The Bill Burr astro-turf pitch is a fabulous facility, which will provide physical education opportunities to the pupils of Northfield Academy and local sporting groups so it will be a real community resource. facility years in advance of their developer contributions requirements associated with the Persley Den housing development.